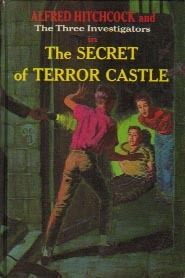 The following is a list of the 43 titles which made up the original The Three Investigators series plus the unpublished 44th title. Click on a title to view scans of each of the published covers and to read detailed collector information about that title. 44. The Mystery of the Ghost Train - M.V. 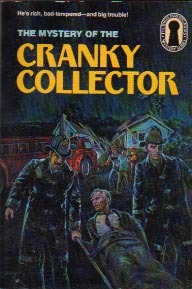 (Mary Virginia) Carey and editor Eugenia Fanelli were working on this particular story when the series was canceled in 1987. It is not known with certainty whether or not a manuscript still exists. Ms. Fanelli was interviewed in the 1990's and again in 2010. Although this story existed in a complete narrative form, Ms. Fanelli described the manuscript as "unfinished" to both of the researchers who interviewed her because she felt that "it simply was not a good mystery". She rejected the story for publication and was working with Ms. Carey to revise the manuscript into something that could potentially be published. Ms. Fanelli and artist Robert Adragna both confirm that cover art for "Ghost Train" was never commissioned for this story by Random House. *My thanks to Tom Calhoun, who interviewed Ms. Fanelli in the 1990's, and to a very dedicated private T3I researcher, who extensively interviewed Ms. Fanelli in 2010, for providing information on "Ghost Train". UPDATE Oct. 2, 2018. In May of 2017 I learned that the manuscript for Ghost Train is in the possession of the Carey family and that Random House has expressed no interest in it. The "working" title on the manuscript is The Mystery of the Counterfeit Train Crash. As of this date the heirs are apparently still in the process of determining what best to do with the manuscript. My suggestion to the Carey family, in June of 2017, was to sell the manuscript to the German publisher, Kosmos, with the strict stipulation that the story be published in an English edition so that English-speaking fans could FINALLY read and enjoy this legendary lost manuscript. Fans may recall that both Peter Lerangis and Gayle Lynds sold their unpublished Crimebusters manuscripts to Kosmos but neither book was officially published in English. This led some creative and industrious fans to purchase German copies, translate the stories back into English, and then self-publish their own copies. Understanding the world-wide legendary status that this lost manuscript has developed over the years, there is great potential and opportunity here and the publication of this book should be something very special. I made the suggestions that it would be extremely nice if U.S. Three Investigators artist, Robert Adragna, the only U.S. artist to paint covers for all 43 titles in the original series, were commissioned to design and paint a new cover for this book. Perhaps 7 internal illustrations would be a nice bonus, as well. And, since the original blue cemetery end papers can't be used, why not use the nearly-as-legendary red alternate end papers designed by Harry Kane? Published in German and in English, I think that Kosmos would very likely have a best-seller on their hands for years to come.